We will be pleased to reply to any of your query regarding our courses and available services. Please use below contact details for course booking and more information. Note: * Kindly take note that there are multiple sessions each worth 2-hours on any day planned for workshops like CPR & Choking Care Workshops or Advance Bleeding Control Workshops. 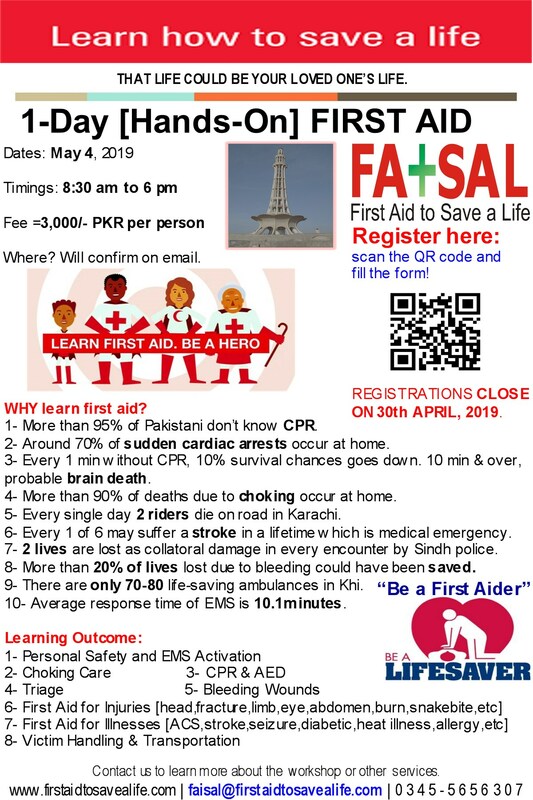 01:- Certification: Successful participants will receive (individual) successful certificate with 2-years validity (requiring annual refresher) card from MEDIC First Aid or ASHI. 10:- Professional CPR-AED training manikins (with CPR monitor) for realistic experiences and feedback. Also the AED trainer device to learn how to safely use it. 11:- First aid supplies for pure training purposes. 12:- Training booklet, wallet card, certificate, lunch and tea are included in course fee. 01:- Certification: Successful participants will receive (individual) successful certificate with 2-years validity (requiring annual refresher) card from FATSAL and their training partners. 02:- Training Booklet: Student Guide Book for every individual course participant. 05:- Safe and effective safety procedures and techniques based on latest industry guidelines. 08:- Significant classroom time for discussions & hands-on practice. 10:- Training tools available for realistic experiences. 11:- Certificates, lunch and tea are included in course fee. Also do read our comprehensive article on “Why choose FATSAL”?